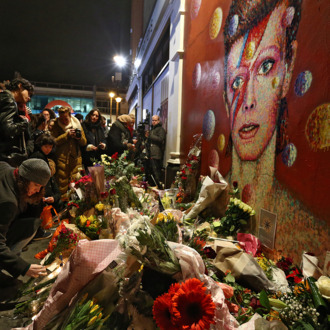 Fans have been flocking to David Bowie’s mural in his hometown of Brixton a day after learning of Bowie’s death, leaving all sorts of tokens to honor their local hero. But as night fell, the eulogy for Bowie appeared to turn into a celebration of his life and music. The BBC reports that one fan with a guitar led a mass sing-along of Bowie hits like “Starman,” “Changes,” and “Life on Mars.” Brixton’s Ritzy cinema (where the mural is located) reportedly put out a call on social media to have a street party (a nod to Bowie’s famous song with Mick Jagger) outside their theater to pay tribute to Bowie, putting the words “Our Brixton boy” on its marquee.